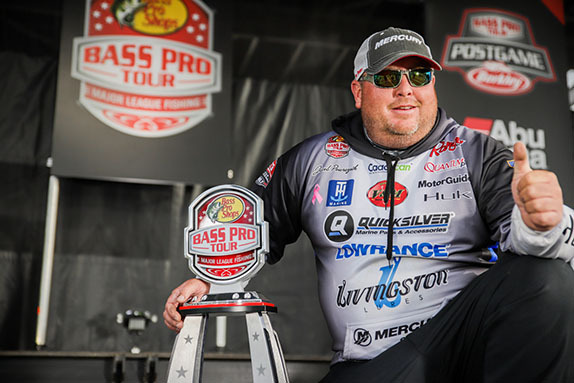 Jacob Powroznik's huge final period propelled him to victory at the MLF Bass Pro Tour event in Raleigh, N.C.
Jacob Powroznik was naturally pumped when the Raleigh, N.C. event was announced as part of the MLF Bass Pro Tour's inaugural schedule. The city is less than a two-hour drive from his home in North Prince George, Va. and he'd fished each of the three venues (Jordan Lake, Falls Lake and Shearon Harris Reservoir) on multiple occasions. The late-March timeframe meant the big bass in those lakes would either be spawning or just on the verge of it. Either way, a high percentage of them would be in shallow water. "With the time of year, I knew we'd either hit it dead on the head or miss it by a week," he said. "We really just missed it � it's about a week from really showing out." After mediocre showings in the Shotgun and Elimination rounds at Jordan and Shearon Harris, respectively, Powroznik turned his game up several notches in the Knockout and Championship rounds to make the short drive home with his second tour-level trophy. He caught 20 fish for 63-04 in the finals to outdistance runner-up Jacob Wheeler by about 3 1/2 pounds. "It's like the best feeling in the world, but it's going to take a couple days to really sink in," he said a day after the conclusion of the event. "You work so hard to get that opportunity, and then on the drive home you're just worn out and tired. "You have all this adrenaline going through you when you're competing, and then suddenly it's over and it's a done deal and it's a big relief. That feeling is what it all comes down to." Competitors got one practice day on Jordan and one on Falls. They were allowed to ride around (but not fish) on Shearon Harris on one of their off days during the event, but Powroznik passed on that opportunity due to his familiarity with that body of water. "I figured Jordan would pretty much be a flipping/ChatterBait type of deal," he said. "Falls was going to be kind of a 'run around and junk-fish' thing. They sucked so much water out (of Falls) that the fish got out and suspended." 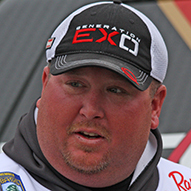 He narrowly made it out of the Elimination Round as his eight-fish, 20-01 haul at Jordan (compiled by flipping and pitching a V&M J-Bug of his own design and a V&M Trickster) and five-fish, 12-13 performance at Falls (homemade, flat-sided crankbait and a Livingston Shredder 53) combined to give him the final position inside the cut in Group A (20th place). He fared much better in his second crack at Falls two days later, finishing 3rd in the Knockout Round with 10 fish for 39-10. The Shredder and the J-Bug were the biggest players that day. "The water had come up a little after I'd fished there Thursday and that allowed a few fish to get up on some stumps in a little depression," he said. "There were seven stumps and I caught a bass off every one of them. That's what got me to the Championship Round." At 4,100-acre Shearon Harris, a fish that came out and rolled on his wacky-rigged V&M Chopstick told him that fish were on the beds. He could see a few and tried a bit of sight-fishing, but deduced that it would be better to keep his boat farther back and make long casts to likely spawning locales. "I just ran all the spawning pockets and no one of them was better than any other � there were about 10 of them in all. I was fishing kind of slow, but fast � covering a lot of water." He targeted small clumps of grass that protruded out into the water from the bank line, thus forming mini-points. He trailed Wheeler, who had a huge second period, but more than 13 pounds at one juncture, but put together a 32-pound final period to claim the victory. He moved into the lead with a little less than an hour remaining when he caught a 6 1/2-pounder and a 4 within three minutes of each other. He boated a 5 not long thereafter. "That one followed the Chopstick in and boiled right at the boat," he said of the 5-pounder. "I went back about 10 minutes later and caught it. I'd already taken the lead by then, but that ran it up there a little bit more." > Worm gear: 7' medium-heavy Quantum spinning rod, Quantum Smoke S3 size 30 spinning reel, 20-pound Hi-Seas braid (main line), 15-pound Hi-Seas fluorocarbon (6' leader), size 1 Mustad TitanX Wacky/Neko Rig Hook, V&M Chopstick (green-pumpkin). > Cranking gear: 7' medium-action Quantum KVD rod, Quantum Smoke S3 casting reel (6:1 ratio), 15-pound Hi-Seas fluorocarbon, homemade flat-sided crankbait or Livingston Shredder (shad colors). > Flipping gear: 7'10" heavy-action Quantum Tour PT flipping stick, Quantum Smoke S3 casting reel (8:1 ratio), 25-pound Hi-Seas fluorocarbon, 3/8-ounce Elite Tungsten weight, 5/0 Mustad Denny Brauer Grip-Pin Max Flippin' Hook, V&M J-Bug or V&M Trickster (green-pumpkin). Champlain � "You can go up there and catch more fish than any other place in the world. It's just awesome." Pickwick � "That place seems to stump me every time." Dad � "He's been there for me and has been a great role model." "I love the competition and it's what I've always wanted to do."